PDF Books, Articles, etc: Get Jon Paulien's BEST Published Books, Articles, and Transcripts in PDF (compatible with most Computers and eBook Readers) ... Download them in minutes! You can buy them individually or all-together in a Bundled Special. Explore Revelation: Jon Paulien's EXPLORE REVELATION -- VERSE BY VERSE STUDY is his most comprehensive presentation on Revelation to date. Learn how to unlock the secrets of Revelation! 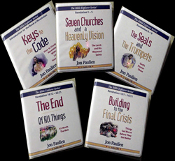 While the Revelation: Hope, Meaning, and Purpose TV presentations are simplifed and extremely helpful information ... it is more limited in scope ... like an airplane view... compared to Explore Revelation 60 Audio CDs. 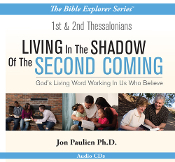 Explore Revelation series is comprehesive like a Bible Commentary and leaves out nothing! These are great for group Bible Study. Downloads Note: Allow for up to 1 Business Day to receive your Download Instructions for Audio Files. Typical week-day wait during normal business hours is under 1 hour. Please be patient with us for occassional delays on evenings, nights, or weekends! Downloads are available for ALL the Bible Explorer Series by various other Teachers! We have SECURE SERVERS for the ORDERING PROCESS! PAYPAL NOTICE: Invoicing is through "SOLVING CONFLICTS LLC". NOTE: Watch Revelation: Hope, Meaning & Purpose with Jon Paulien every week on Hope TV: Either HopeTV.org or on Direct TV -- Click Here for their Schedule to look for times.